The Biosphere Potsdam will spoil your guests during your event with in-house catering. 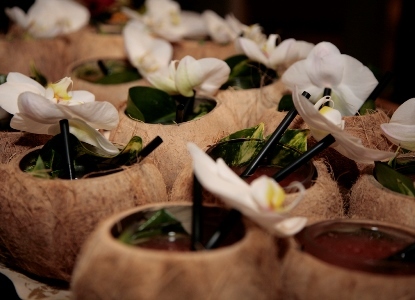 Before you take your breath-taking journey through the jungle, we will welcome your guests with a tropical cocktail and finger food. We can provide a variety of buffets. The versatility of our cuisine ranges from tropical to rustic to international buffets and is an unforgettable, culinary experience under the palms for everyone. We are also happy to serve set meals in our restaurant. We can adapt our selection of meals to suit your event: conference snacks, BBQ buffets, wedding meals, family brunch, welcome snacks, live cooking - we are happy to advise you! All our meals are freshly prepared by our international kitchen team. Choose from our suggestions or have a buffet or set meal tailored to your event. "Lost on a tropical island"